The website icu-diary.org is the base of an informal network for all health care workers that are interested in the icu diary. We offer literature, descriptions and help for implementation. We try to coordinate informations, projects and new studies. And we try to connect people. The network is founded by Eva Akerman, Carl Bäckman, Ingrid Egerod, Christina Jones, Dirk Knück, Peter Nydahl and Sissel Storli. There are no financial or commercial conflicts or interests. 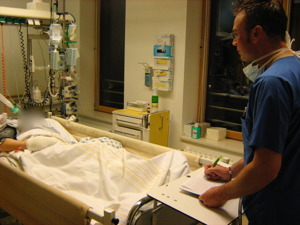 The ICU diary is a diary that is written for ICU patients during their time of sedation and ventilation. It is written by relatives, nurses and others. The patient can read his or her diary afterwards and is more able to understand what has happened.